In the UK a small but very diverse family of 38 species included in 13 genera and 7 subfamilies although other species are occasionally imported with stored products. At least some of our species are familiar to most people as they are found indoors both as larvae and adults; Larder beetles (Dermestes spp. 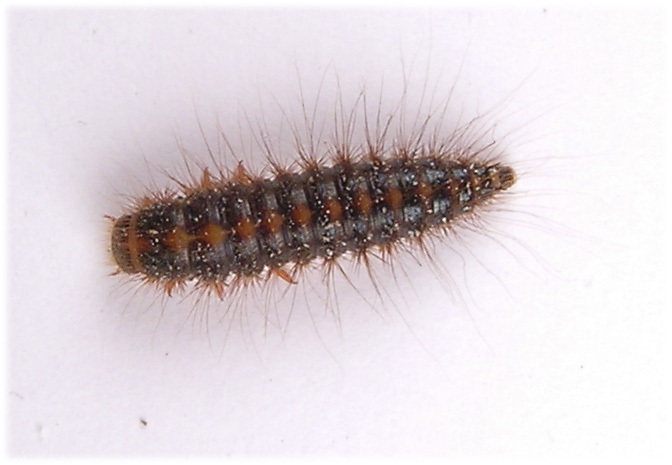 ), Carpet beetles (Anthrenus spp.) and Fur beetles (Attagenus spp.) are all widespread, common and active during the warmer months. Although infestations can damage carpets and fabrics and ruin stored foodstuffs, the presence of occasional specimens at windows or crawling across ceilings or walls is generally harmless as these species, as well as forming infestations, will develop in small numbers within cracks in wood and floorboards, furniture or at carpet/wall junctions feeding on dead insects and food particles in fluff and dust etc. As well as attacking carpets and fabrics, fur and carpet beetles have the very unsociable (from our point of view) habit of feeding on collections of dried animals and insects, their presence indicated by dust beneath the specimens or shed larval skins. More than half our species are syanthropic, having expanded their natural range across the world by following the spread of humans. Some are pests both as adults and larvae while others are scavengers living on scraps of food etc. where hygeine is not rigorous. Some species live only part of their lives around human habitations e.g. carpet beetles will feed on pollen and are common on flowers in warm weather. Most dermestids feed wholly on animal products although some may be found among other food e.g. Anthrenus verbasci (L.) will infest stored food products which are not its preferred food and Trogoderma granarius Everts feeds almost entirely on vegetable foodstuffs, being a major pest of cereals and grain products. The presence of dermestid species among vegetable matter must not be taken as an indication of a foodsource as they may well be living on other insects, dead or alive, within this host. Some species live entirely in the wild e.g, Megatoma or Ctesias are associated with dead trees while Globicornis is found among grass or foliage. Dermestid natural habitats are very diverse and species occur in the webs of spiders and caterpillars, in hymenopteran nests and those of birds and mammals and around carrion and bones. Several species may be found by general sweeping as adults frequent flowers to feed on pollen, they will also be found generally in the course of examining dead trees and fallen timber. Dermestid larvae are usually elongate and very hairy, from above a series of transverse, well sclerotised and dark tergites are usually obvious. They can move rapidly and are surprisingly difficult to catch alive although they may be attracted to traps containing felt pads impregnated with with sardine oil (etc.) and placed on the floor. They have well developed legs with single claws and unsegmented processes (urogomphi) on the ninth abdominal segment. Some species possess hastisetae- spear shaped segmented setae unique to dermestids- which may form tufts on the posterior abdominal tergites. These are readily shed and dermestid larvae are known to produce allergic skin reactions, rhinitis and asthma. Dermestids are small to medium sized beetles, 1-12mm, elongate (Dermestes, Reesa) or broad oval (Attagenus, Trogoderma) to almost circular (Anthrenus) and mostly drab coloured, various shades of brown or black although several species are distinctly marked. The upper surface is usually densely or moderately densely pubescent or covered with scales and these may form distinct patterns. Head to some extent deflexed and usually with a single median ocellus, notably absent in Dermestes spp. Antennae 5-11 segmented, apical segment(s) generally form a club and are sometimes highly modified. With the exception of Thorictodes the pronotum is transverse, narrowed anteriorly and usually with acute hind angles, the basal margin is strongly sinuate - a character used by Joy to isolate them family. The prosternum is generally excavate or distinctly grooved laterally (the hypomera) to accomodate the antennae. The elytra are antire and, with the exception of Thylodrias, completely covers the abdomen, without striae and generally with obvious random puncturation. Hind wings usually present and most species fly readily. Five abdominal sternites are visible and these are pubescent to some extent and somtimes bear tufts of setae, the pattern of which may be useful in specific determination. Like the antennae, the legs can be retracted into ventral grooves so that when alarmed the beetle can appear smooth and continous in outline. Tarsi always 5-5-5. Our single species, Thorictodes heydeni Reitter, is only rarely imported on stored animal and vegetqable products. A small (under 2mm.) shining reddish-brown species, elongate with rounded pronotum which is broadest in front of middle - an exception to the dermestid form. Antennae short, basal segment large and with a 3 segmented club. Includes a single genus, Dermestes, of which ten species are listed. They are medium to large beetles, 5.5-12mm, characteristically shaped and either patterned with pubescence (eg D.lardarius L.) or entirely drab, brown or black (eg D.peruvianus Laporte), without a median ocellus and with 11 segmented antennae terminating in a large 3 segmented club in both sexes. Some species are entirely synanthropic and not found in the wild eg D.carnivorus Fab. or D.leechi Kalik, while others are only rarely found in the wild eg D.frischii Kugelann or D.maculatus De Geer. Some occur in both habitats eg D.lardarius L. or D.murinus L. Hide beetles require animal derived proteins for full development (Peacock), they are carnivores as well as predators and may be cannibalistic both as larvae and adults. In the wild they feed on a range of materials; they are common in birds' nests and sometimes in large numbers; the larvae of D.lardarius (and other Dermestes spp) if present in sufficient numbers will attack and kill ducklings, young pigeons and chickens (Hinton, 1945). They will consume dead insects, dead mammals and birds, feathers, honey and pollen and no doubt other materials within bees' and wasps' nests, bones and remains of carcasses including fish. Under artificial conditions they turn their attention to stored products; they have been recorded attacking leather and fur, bones, horn, feathers and glue etc etc. Much damage may be done by the faeces and cast skins produced by infestations and mature larvae may damage materials they do not use as food by their habit of boring into compact material to construct a pupal chamber, they have been recorded boring into cork, books, cardboard, plastics and wood, plaster, asbestos, woolen and cotton materials and stored tobacco. Mature larvae of D.lardarius and D.peruvarius can bore into lead easily and into tin with difficulty (Hinton, 1945). Both are common in domestic situations during the warmer months. Of our ten species of Dermestes, D.leechi Kalik and D.carnivorus Fab. are only rarely introduced. D.frischii Kugelmann is regularly imported in animal products and sometimes found outside. D.maculatus De Geer (the Hide beetle) is a resident introduction found in animal products and occasionally outside in carrion. D.haemorrhoidalis Kuster and D.ater De Geer are both common in domestic dwellings. 2.3-6mm. Includes 7 species of Attagenus. With the exception of A.pellis (L.) the two spotted carpet beetle, our species occur as regular or rare introductions. The distinctive A.pellis may be found outside in the spring and early summer feeding on nectar and pollen of a wide range of flowers eg Crataegus and Spiraea. Larvae have been found in the nests of birds and bees. In both commercial and domestic premises they are pests of wool, fur and foodstuffs eg cereals. Adults of the genus are distinct in possessing a median ocellus and having the first segment of the hind tarsi half, or less than half, as long as the second. 11 species included within 7 genera are listed as British. All species possess a median ocellus, 9-11 segmented antennae with a 2-8 segmented club and have the first segment of the hind tarsi at least as long as the second. They are all pubescent, or have patches of scale-like pubescent dorsally. 5 species of Trogoderma (1.7-5mm) are synanthropic introductions or have been temporarily resident. T.angustum (Solier) is a recent introduction (Shaw, 1999). Reesa vespulae (Milliron), first recorded in 1977 is thus far a pest of museum collections although there have been a few records from the wild. Globicornis nigripes (Fab. ), 2.3-3mm, is an endangered southern English species, adults occur in the summer among grass and foliage. Our single species of Megastoma is featured. Anthrenocerus australis (Hope) the Australian Carpet beetle is a resident introduction only infrequently encountered in domestic and industrial premises on a wide range of products. Orphinus fulvipes (Guerin-Meneville) is a rare introduction imported on a range of foodstuffs including nuts, ginger, cocoa beans and rice. Ctesias serra (Fab.) is a widely distributed species inhabiting old trees, adults occur from May to August under bark. Includes 9 spp. of Anthrenus, commonly referred to as Carpet or Museum beetles. They are distinctive species which cannot be mistaken for any other. Adults may be found indoors crawling on walls or at windows, and outside on flowers where they feed on nectar and pollen. The larvae of most species cause damage to materials of animal origin eg leather, wool and fur, they will also damage synthetic materials and vegetables if these are impregnated with animal products. A.fuscus Olivier and A.museorum (L.) occur almost entirely in the wild, the larvae live on dead insects and are often found among detritus in or around spiders' webs. A.verbasci (L.) is a common domestic pest of southern England, as well as infesting a very wide range of products it is notorious for its habit of destroying collections of dried insects. A.sarnicus Mroczkowski has recently become established as a museum pest in the London area. Our other species are recorded only occasionally with imports. Our single species, Trinodes hirtus (Fab. ), is a widely distributed 'English' insect associated with wooded habitats, more especially Oak. Adults occur from May to August either on flowers and foliage or near accumulations of dead insects among spiders' webs under bark or in tree crevices. A small species, 3mm or so, broad-oval and widest behind middle, grey with long black pubescence. Without or with a very small median ocellus and pronotum with basal sublateral carina.